Welcome back to the Mattress For Less blog! Those in the Newington area, like the rest of the country, thrive on the accolades of working hard and doing what it takes to get the job done. This mentality is honorable, but it isn’t sustainable as an ongoing lifestyle and it will affect your health. Sleep is one of the main areas of life that takes a hit when we decide to put other aspects of our lives ahead of the health of our bodies. Interestingly enough, getting enough sleep will actually make you more productive, look and feel better, and reach those goals that you have for the new year. 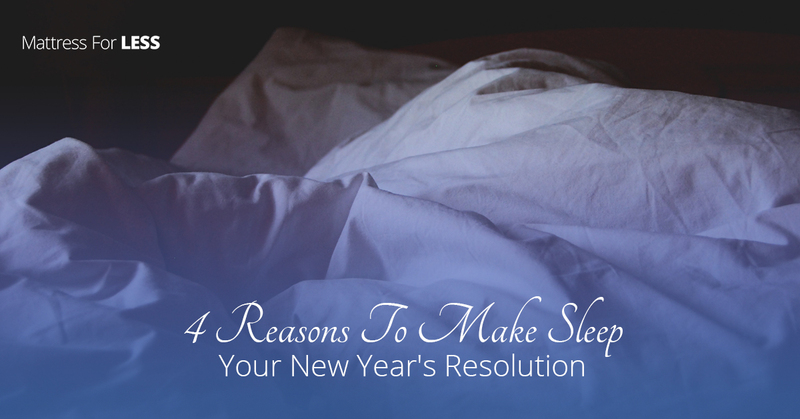 Today, on our blog, we are going to talk about why sleep should be a priority and, possibly, a part of your New Year’s resolution. If you are like most, you probably want to drop a few pounds or at least tone up a bit after the merrymaking of the holiday season. It’s easy to make exercise the “end-all be-all” to your weight loss strategy. However, getting a full night of sleep each night can actually help you lose weight! Not only does your metabolism function at its best, but also, when you get enough sleep and have energy for your day, you are less likely to snack on those calorie-heavy and nutrient-deficient junk foods. Do you ever just feel like you’re dragging through your day—maybe through your life? Being tired isn’t a way to live well. When you get enough sleep, you will have more energy and so will be more productive at work, be more inclined to workout before or after work, and then maybe even spend more time on your hobbies or playing with the kids! Also, as mentioned above, when you get enough sleep, you crave sweets and other junk food less; sweets and similar foods may give you an immediate energy boost but will hurt you in the long run by the crash that always follows. Do you feel dissatisfied with life and feel like you can’t make any progress? In many cases, this is due—in one way or another—to sleep deprivation. While we sleep, our bodies are repairing themselves, including repairing the brain, allowing those chemicals in the brain that make us happy to take full effect. Also, if you are feeling frustrated with your performance at work, maybe try getting in a few more z’s and see if that provides you the brain power you need to dominate at work—and at home. For many, the new year is all about being their best selves; they want to look better than they ever have. For most, reaching this goal is through weight loss and possibly a makeover. However, looking better doesn’t always have to be achieved through just strenuous exercise. Sleep can have miraculous effects on how we look. Not only do we have more energy to carry ourselves better which can make us look more confident, but also getting rid of the dark circles under our eyes can take years off of our faces. With all that being said, are you ready to make sleep a bigger part of your life here in the Newington area? Do you have a comfortable mattress to help you get on track with your sleep goals? To get quality, affordable mattresses, visit your local Mattress For Less!